The nine-member Commission of Enquiry for the creation of new regions will meet Members of Parliament from the four regions under consideration by the commission on Friday afternoon. MPs from the Northern, Bono Ahafo, Volta and Western regions will be briefed by the Commission on the process so far. They would also be expected to make input into ongoing consultations. The Commission was tasked to look into the demands for the creation of new regions. It has so far concluded some public stakeholder engagements in the regions concerned. The process is expected to culminate in the conduct of a referendum on the creation of the new regions. The government’s decision to set up the commission was in response to petitions made for the possible creation of the new regions. President Nana Akufo-Addo referred petitions from Chiefs and organisations of the named regions to the Council of State for advice, which were approved. The Commission’s Terms of Reference is set out in paragraph 4 of C.I. 105. It is to make recommendations to the President, based on its findings, on the creation of a region or alteration of regional boundaries; and to specify the issues to be determined by referendum and the places where the referendum should be held, where it makes recommendations for the creation of new regions and alteration of regional boundaries. 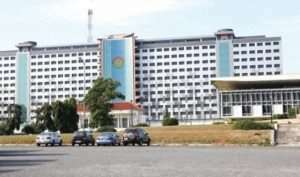 The nine-member Commission, which is chaired by Justice S.A. Brobbey, a retired Supreme Court Judge includes Dr Grace Bediako, former Government Statistician; Maulvi Mohammed Bin-Salih, Ameer of the Ahmadiyya Muslim Mission in Ghana, Prof. Kwasi Kwafo Adarkwa, former Vice Chancellor of the Kwame Nkrumah University of Technology and Ms. Gladys Tetteh, a local governance expert.